This post has been updated to reflect current information on the phasing in of new five-compartment lunch trays. Products made from polystyrene (the material we typically refer to as Styrofoam) will be phased out of use in PGCPS cafeterias during the 2015-2016 school year. A recent Washington Post article noted the efforts of Montgomery County and D.C. schools to use more sustainable cafeteria products: Montgomery County has already abandoned the use of polystyrene lunch trays and D.C. uses reusable trays as well as compostable trays. While PGCPS was not mentioned in the Post article, according to the school system’s Department of Food and Nutrition Services, we will see a shift away from polystyrene products used in cafeterias in the coming months. A Food and Nutrition Services staff member explained via phone conversation that PGCPS plans to discontinue use of polystyrene breakfast and lunch trays, replacing them with paper products. Other polystyrene products used in cafeterias will also eventually be phased out. Cafeterias will continue to serve meals on polystyrene trays until the stock that vendors hold in reserve for PGCPS is depleted. For breakfast trays, the switch from polystyrene to paper could happen as early as this month. Food and Nutrition Services staff could not yet provide a date for when the polystyrene lunch tray stock will be depleted, but those trays will likely be phased out early in the 2015-2016 school year. Detailed specifications for the new products coming to PGCPS cafeterias are not yet available. 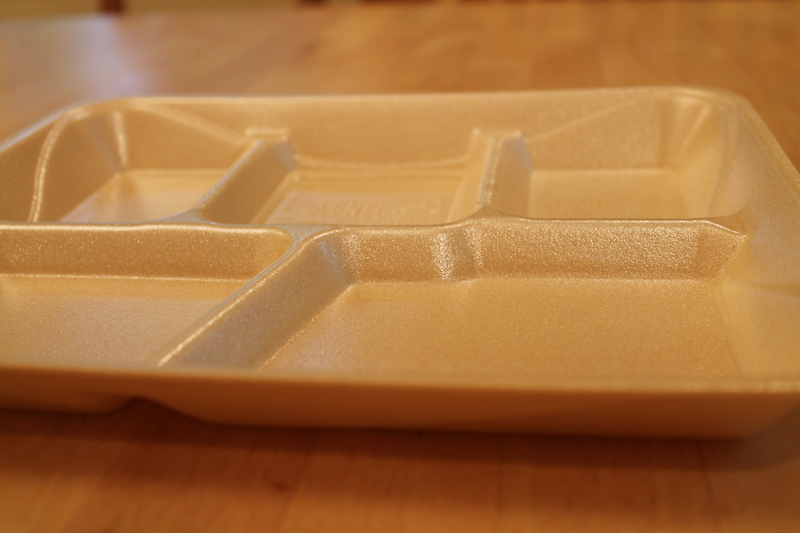 Update on July 2, 2015: In an email communication from PGCPS’s Department of Food and Nutrition Services, we learned that the new five-compartment trays under consideration are biodegradable, compostable, and made with 100% recycled molded paper fibers. The goal of the department is to begin the school year with no polystyrene, but this is dependent on what the vendor and what school sites have in inventory. Though the new lunch trays will likely be compostable, PGCPS currently has no composting program.